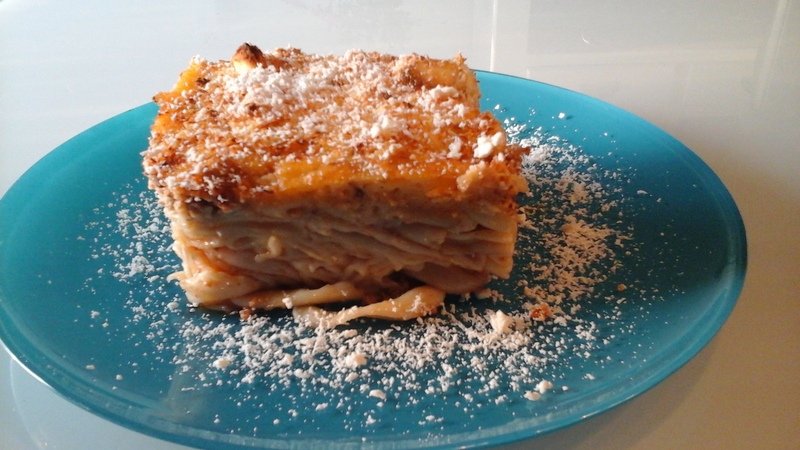 Pastichio is a deep oven baked pasta classic Greek dish. This dish is layered with tubular pasta and or any other long pasta you can find in your local supermarket. The meat mixture is basically made from half beef, half veal with tomato sauce and grated cheese as a topping. It is a bit time consuming but if you make the mince meat sauce the previous day, and keep it over night in the refrigerator than the process is quicker. It is topped with homemade Becamel sauce and grated cheese. Pastichio is a main course dish, served at Sunday family gatherings, with salad and a nice glass of wine. We take our sauce pan, add 2 teaspoons of Salt and just a dash of oil and boil the pasta. Strain and set aside for later. Tip: Adding the eggs holds the pasta together. In a sauce pan add all the ingredients for the Bechamel sauce except for the flour. We stir and bring it to a light boil, start to add the flout one tablespoon at a time and continue to stir, so that it does not become one big mass. Once the sauce has thicken take it of the stove and pour it slowly onto your meat mixture, starting from one end of the pan to the other. Repeat the process until you have covered the meat sauce. Top it with grated cheese, and bread crumbs and its ready pop into the oven. Baking time is about one hour. Tip: I like to add an additional whipped egg onto my Bechamel sauce, before i sprinkle on the grated cheese and breadcrumbs. This gives it a darker finish. See you soon with another traditional Greek recipe!! I really have to try this one. Thank you for sharing your recipe with us. HI, this looks great! I have never heard of this dish before, thanks for sharing it and thanks for stopping by my blog and checking it out! Hi, thank you!!! It's a traditional Greek Dish. I am very new at Wordpress, so while searching for other blogs, I came across yours and I truly enjoy it!!! :) Thank you!!! hahhahahha thanks for having me!!! !